Home > Departments > Faculty > John Aylward Ph.D.
John Aylward's music has been praised for its 'brilliant energetic rhythmic figures…imaginative sonorities and harmonies that always move, always inflect' and its 'zones of suspended motion and otherworldly calm' (American Academy of Arts and Letters). Aylward's music is consistently performed within the U.S and abroad by numerous leading ensembles and soloists. Influenced by a range of philosophical and poetic authors from Sartre and Jung to Calvino, Melville and contemporary poets Louise Gluck, Robert Lowell and Dean Young, Mr. Aylward's work explores the landscape of the human psyche. Through rich expansive sound worlds and compelling sonic events, his music threads narratives that can electrify or subdue. Like the philosophers and authors who inspire him, Aylward's music questions our fundamental personal and worldly relationships. 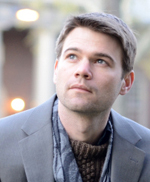 Mr. Aylward has been awarded a Goddard Lieberson Fellowship from the American Academy of Arts and Letters, a Radcliffe Institute Fellowship from Harvard University, a Koussevitzky Commission from the Library of Congress, a Fulbright Grant to Germany and First Prize from the International Society for Contemporary Music (ISCM) among other honors. He has also been awarded fellowships from the MacDowell Colony, Tanglewood, the Aspen Music School, the Atlantic Center for the Arts and the Virginia Center for the Creative Arts. Mr. Aylward has recently completed commissions from Sound Icon, the Boston Conservatory Wind Ensemble, the Washington Square Contemporary Music Society, and from a special audio volume of Perspectives of New Music. Upcoming projects include a work for Ensemble Harperc, a percussion quartet for Samuel Solomon, and a multi-media project with Bill Barclay, Director of Music at London’s Globe Theatre. Mr. Aylward's writings on contemporary music can be read in Perspectives of New Music and the Mitteilungen Der Paul Sacher Stiftung. As a pianist, Aylward regularly performs contemporary music worldwide. Recent concert dates include Harvard's Paine Hall, The Collis Center at Dartmouth, The American Composers Forum in Washington, D.C., the University of Campinas in Sao Paulo, and Distler Hall at Tufts University. Mr. Aylward is founder and Artistic Director of The Etchings Festival, held each summer in Auvillar, France. The festival has attracted acclaim for its masterclasses and lessons, taught by luminary composers Philippe Hurel, Stefano Gervasonoi, David Rakowski, Fabien Levy, Louis Karchin, George Tsontakis and Lee Hyla. Mr. Aylward has also taught at Tufts University and at Brandeis University. He lives in Boston, Massachusetts and is originally from Tucson, Arizona.